Each year, thousands of birthday and wedding anniversary cards are sent on behalf of The Queen to people celebrating significant milestones. For many, receiving a congratulatory card from Her Majesty is a very special part of their celebrations. The delivery of these messages is arranged by the Anniversaries Office at Buckingham Palace, continuing a tradition which goes back to 1917. 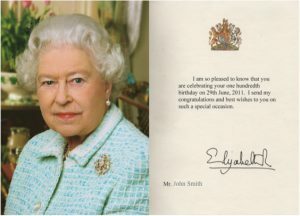 The Queen’s congratulatory messages consist of a card containing a personalised message and come in a special envelope. To make sure that a message is sent for birthdays and wedding anniversaries, an application needs to be made by a relative or friend in advance of the special day.